wow... 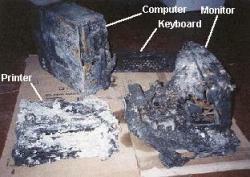 I am sorry to hear that this happened, but you can always be thankful that it was only the computer that burned down and not the whole house with everyone in it? Life is one heck of a ride, so hang on tight! Ouch. Talk to the PSU maker, they ought to reimburse you for damage caused by their product. *cough* What's the date today?